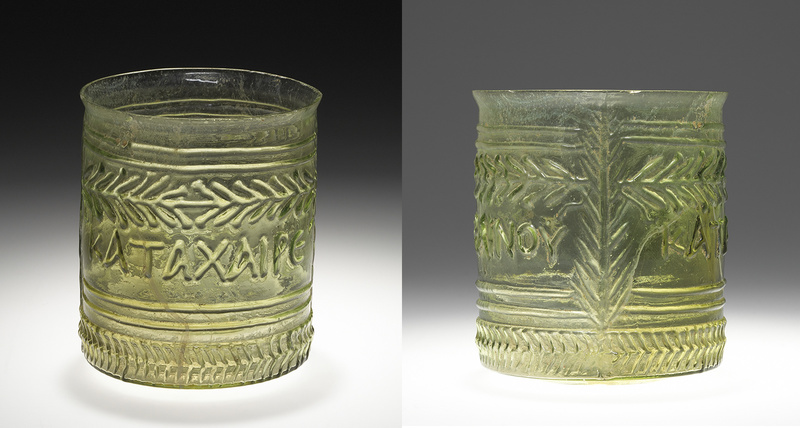 With its delicate contours, vibrant colors, and intricate surface ornamentation, Greek and Roman glass made in antiquity is still a delight to the eye. The Getty Villa boasts an extensive collection of ancient glass, with pieces dating from about the mid-second millennium BC to AD 600. The recent reinstallation of the Villa prompted us to revisit how best to exhibit this material. 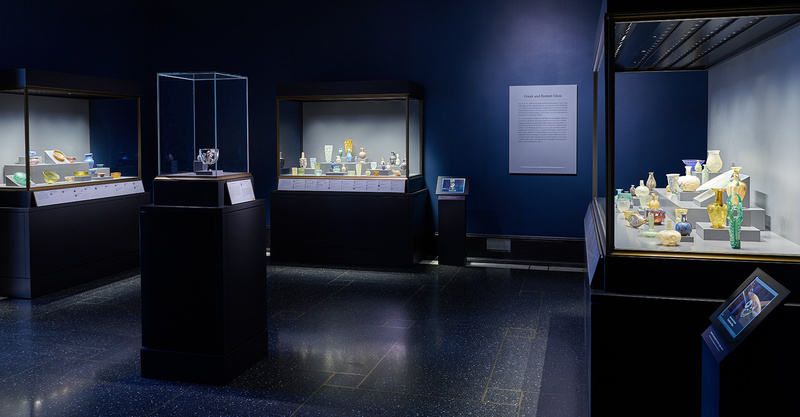 One option was to organize the glass by when and where it was made and form it into small groupings throughout chronological galleries. 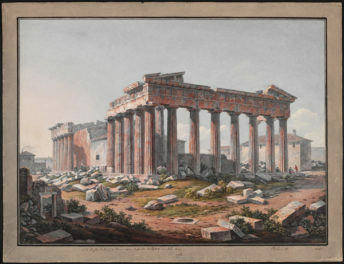 But what we wanted to emphasize more than place of origin was the link between aesthetics and technique of manufacture—how the development of ancient glass is the story of these two qualities’ reciprocal evolution. Showing glass from multiple periods and places all in one dedicated room, rather than spreading the objects out across the museum, makes it far easier to follow this narrative. In the end, therefore, we decided to keep the glass in the same space—Gallery 214—but give the display a facelift. The new arrangement is organized by manufacturing technique, such as free-blown glass or cameo glass, complemented by videos of glassworkers demonstrating these techniques. These brief videos help bring ancient glassworking to life and are available both in the gallery and on the Getty Museum’s YouTube channel. Below are five particularly stunning vessels that illustrate the connection between manufacturing technique and decoration. The more carefully one examines these small works of art, the more reward they yield. From the first century onward, most glass vessels were made by glassblowing: a gob of glass was gathered on the end of a blowpipe and then inflated. The hot glass bubble could be manipulated in various ways to produce different shapes, sizes, and surface treatments. 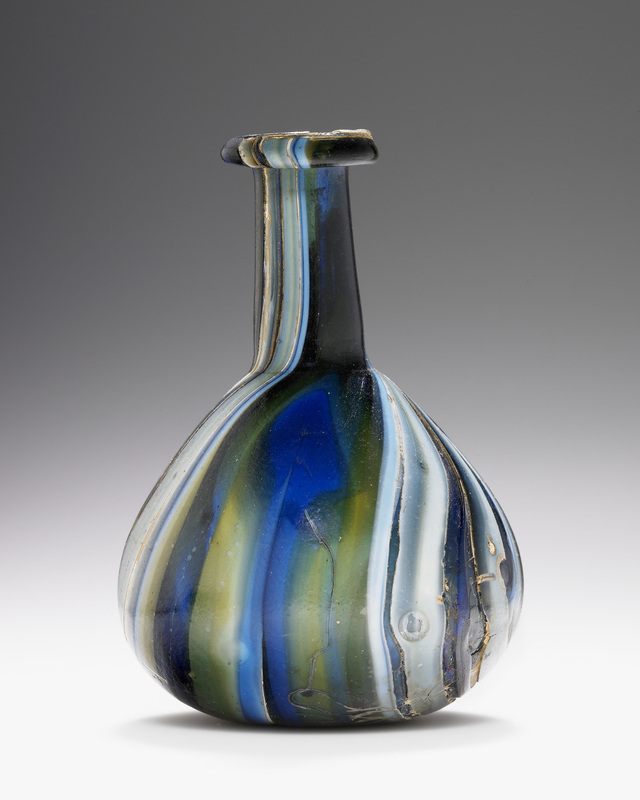 To create multicolored vessels, glassworkers developed techniques like color-band glass, which produced this flask. 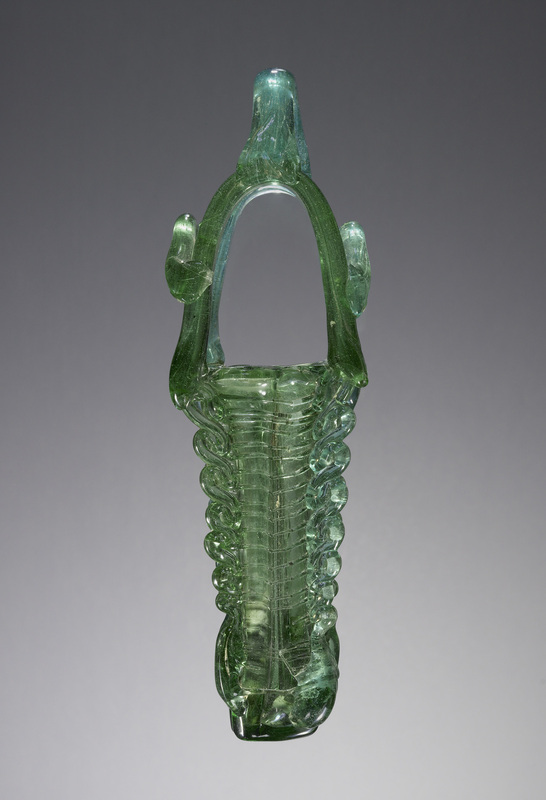 The glassworker fused together glass canes in multiple colors to form a single gob. Inflating the gob resulted in vertical bands of alternating dark blue, purple, green, and white. If you look closely you’ll see the fluid gradations within each band of color—for example, a large band transitions from pure white into icy blue and then stormy blue as it begins to mix gradually with the adjacent dark blue glass. The effect is almost hypnotizing. In the early Roman Empire, from about 25 BC to AD 25, craftsmen in Rome refined the technique of cameo glass. The glassworker began by partially inflating a gob of colored glass (usually dark blue), then added layers of glass in other colors (usually white), and fully inflated the vessel. A lapidary—an artist who carves gems and naturally layered stones—was probably the one to carve away the outer layers into figural designs. Cameo glass vessels are rare, and the Getty Villa is fortunate to have two in its collection, both of which are on view in Gallery 214. Both sides of this skyphos (two-handled drinking cup) bear scenes of Ariadne reclining on a rock, accompanied by the followers of her husband Bacchus (Dionysos in Greek mythology), who drink wine and play musical instruments. The artist who carved the scene achieved a remarkable degree of detail in each figure. Look, for instance, at the individual strings of the lyre a satyr plays at center, or the drapery of the seated statue of the goddess Cybele atop a tall stele behind a tree at the right. Like the color-band flask above, this bowl has alternating bands of color, but here a different technique achieved the striped effect. 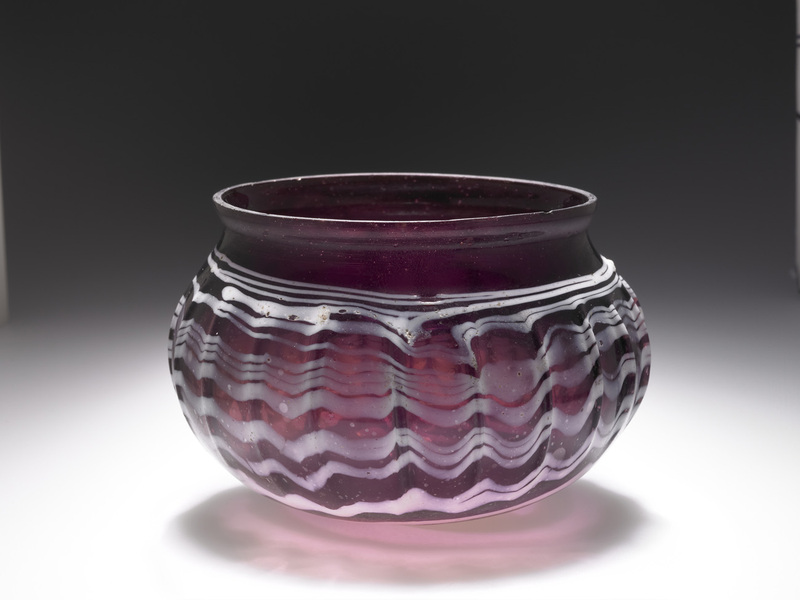 To make this bowl, the glassworker wound a trail of hot white glass around a purple glass gob. Marvering it (rolling it against a slab) fused the trail into the gob to create a smooth surface. After marvering, the glassworker partially inflated the gob into a one-part open mold, called a dip mold, whose interior had been carved to imprint the vertical ribs around the vessel’s body. The partially inflated gob was removed from the mold and fully inflated. Such bowls are often called zarte Rippenschalen (delicate ribbed bowls). Notice that the white trail ends at the top of the vessel’s shoulder and does not continue up onto the neck and lip, which are solid purple. This pattern is typical of zarte Rippenschalen. Look closely to spot the point near the vessel’s neck where the white trail ends. You’ll also see that the glassblowing resulted in a distended pattern, making the white trail thicker toward the base of the vessel and thinner as it moves up toward the neck. 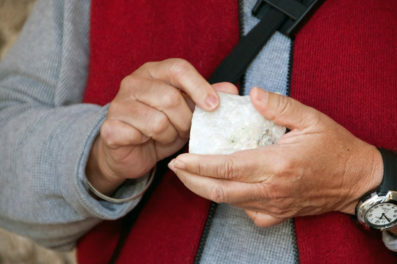 In the mold-blowing technique, the glassworker inflated a gob of glass into a clay or stone mold, usually made of two or three parts. The carved designs on the mold’s interior imprinted in relief on the vessel. Some molds were inscribed with messages for the vessel’s user. This pale green drinking cup is decorated with horizontal bands and a wreath pattern. A Greek inscription curves around the center of the cup’s body: KATAΧΑΙΡΕ ΚΑΙ ΕΥΦΡΑΙΝΟΥ (“Greetings to all, and be of good cheer!”). Good-wish inscriptions seem rather appropriate given that such cups were likely used to consume wine at banquets and drinking parties. Vertical palm fronds on either side of the vessel cleverly disguise the seam marks left by the mold—they become the fronds’ stems. Tall tubes like this one were used in antiquity to hold cosmetics, not unlike a modern tube of mascara. This four-chambered kohl tube is made from two pairs of blown glass tubes fused together. The glassworker created the multipart handle and elaborate surface decoration by applying several glass trails of varying thickness to the vessel. On the handle, the spots where the trails were attached to one another are marked by thick blobs. On the body, substantial vertical trails create a dramatic wave pattern along the four corners, while a thin horizontal trail winding around the vessel from top to bottom adds a subtle surface texture. These are just a few examples of the vessel types and decorative schemes you can see in Gallery 214. If you’re interested in learning more about ancient glass in general or the Getty’s collection of it, Karol Wight’s book Molten Color: Glassmaking in Antiquity is a great introduction. 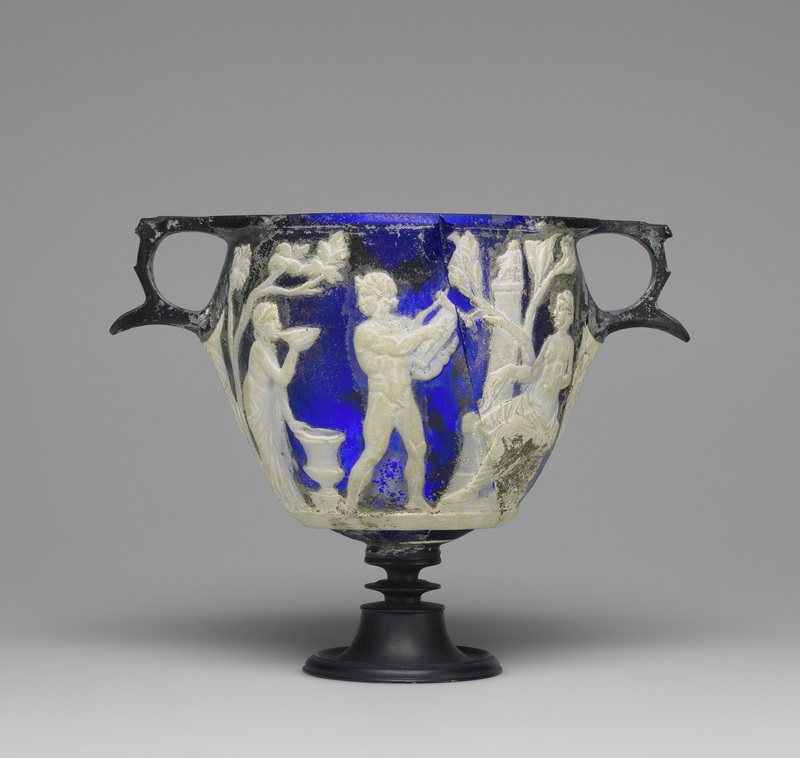 Whether you explore these exquisite pieces in person at the Getty Villa or in books or online, you will surely be dazzled by the technical and artistic details of glass created many centuries ago.